At Jim Haas Builders, Inc. our relationship with the homebuyer does not end with the closing of your home. Our customer service professionals pride themselves on taking care of the homeowner's warranty needs for one full year. Details can be found in the Performance Standards and Warranty guidelines contained in your Homeowner's Manual. 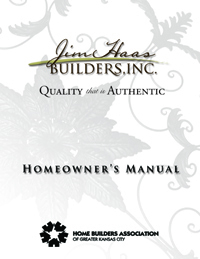 Our Homeowner's Manual is a book of useful documents providing detailed information of the construction process as well as the care and maintenance of your home. It also serves to describe which items are the builder's responsibility and which are the homeowner's. This book is provided at the time of contract.